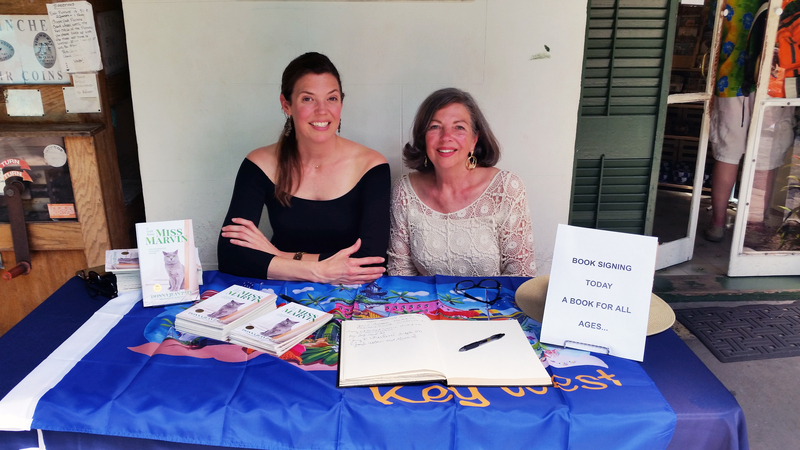 Recently author Donna Paff and illustrator Bella Viva were invited to visit the Ernest Hemingway Home & Museum in Key West, Florida for a special tour and to sign copies of their book, A Visit From Miss Marvin. The delightful children’s book, whose titular character is a polydactyl “Hemingway” cat, has been a popular item at the museum store for some time now. Museum staff thought it would be fun to host an event for Miss Marvin, so they extended an invitation to Donna and Bella. On May 9 the pair were warmly received at the Hemingway Home, and they spent the day meeting visitors and fans, signing books, and making new friends young and old. Congrats to Donna and Bella for this wonderful opportunity! A Visit From Miss Marvin is the story of a charming cat and her elderly companion, Mr. Smith. The two friends stick together through thick and thin, and always make the best of life’s changes. The Ernest Hemingway Home & Museum is the legendary writer’s former estate in Key West, Florida. It is home to several dozen polydactyl cats, some of whom are descendents of Hemingway’s own pet cat. Photo courtesy of Donna Paff.